New Year, New Starts, and some Finishes! Happy New Year! Here’s hoping it’s a good one. Things went kinda crazy at the beginning of December, what with the particularly virulent strain of flu going around. I haven’t been sick yet, but about half of my coworkers have, and that makes for lots of overtime and not much else. There’s no end in sight yet, either. I still managed to find stitching-time, though. Or forcefully carve it out of what little free time I had, as it were, and finished a kit from my stash and a quick stitch for my mother. I like the detail in the kits from this company, but the threads took some getting used to. They’re a lace weight yarn, rather than floss. These guys need ironed, and then I’m possibly taking them to a craft store/framer in town. Dimensions are 9 3/4 x 9 3/4 inches. I’m particularly fond of this, as I had an African Pygmy Hedgehog as a pet when I started it. He developed wobbly hog syndrome and has since died. A quick stitch for my mom; one of her favorite flowers. It’s around 5 x 6 inches on 16 count (63 x 77 stitches) with yarn again, instead of floss. I’ll probably end up mounting this on foam board and adding a hanger on the back. And now for the starts! Attempted gridding with 5lb fishing line. Still not sure what to think of it. Either way, one more kit from the stash is in progress, and I am reminded of why I loathe 14 count Aida. 2 strands of floss just won’t provide satisfactory coverage, and with a kit, I’m hesitant to increase the number of strands in use at a time. So! I grit my teeth and deal with it, and remind myself that from a proper viewing distance, it’s not going to be as bad as it looks to me while I’m working on it. This NFSAL is ongoing over at the Stitching Pirates group on dA. I chose the option to do it as one big piece instead of 12 small ones. The fabric is MCG Textiles 28 count evenweave in natural, with DMC 597, 3808, and 3825. Stitched 2 over 1 so that the stitches would stand out a bit more. So far, I’ve spent almost as much time frogging as I have stitching on this one. 😑 That left side? Still needs redone. Somehow I managed to flip the x-es the wrong way, all the way down. For now I am ignoring its existence. In other stitchy news, I’m working on kitting up for a few projects that are going to be rather cost heavy. Two of them are the Small Spices blocks from Martina Rosenberg over at Chatelaine designs – Black Pepper and Ginger. They use almost entirely the same flosses and beads, but the majority of the flosses are silks. Also in the works is Blackwork Journey’s Save the Stitches. I only need one more color of beads for that and it’ll be ready to go. And Autumn Prince (HAED – Kayomi Harai) is ready to go! It’s sits there on top of my stash box, giving me incentive to finish my kits. 1. How did you start or who introduced you to cross stitch? 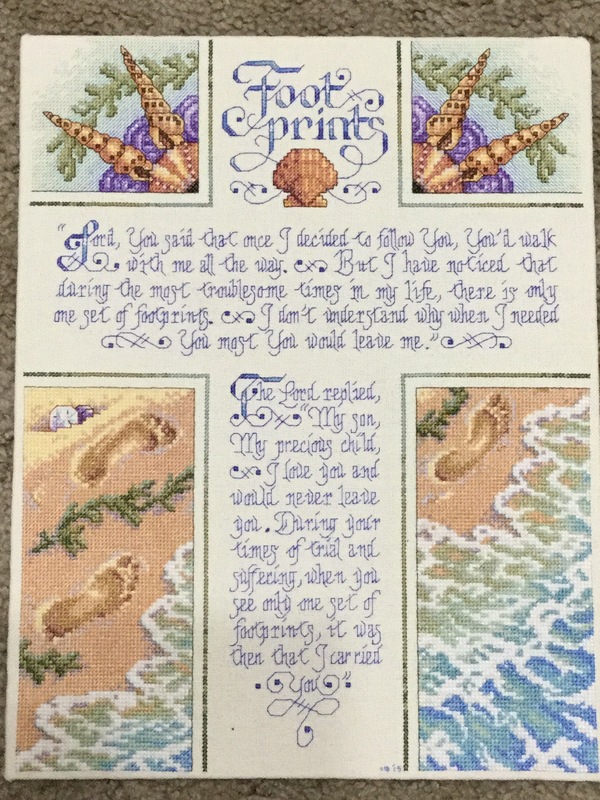 My mom cross stitched, so I was introduced to it by the pieces she had hanging up at home. My first kit was given to my for Christmas by one of my uncles, and it all went to x-es from there. 2. Do you have a favorite theme or designer? Not really. I’m an equal-opportunity stitcher. I don’t care for samplers, or stitching people or buildings. I prefer landscapes and animals or stillife type pictures. 3. What floss brand do you use? 4. What is your fabric of choice? 25 or 28 count evenweave. I prefer Lugana or Jazlyn over Jobelan. 5. Do you use a needle threader or are you a “floss licker”? 6. What kind of stitching frame do you use? My primary frame is the Lap Stitch Doodler Plus from Images Stitchery Design on Etsy. I also have used hoops (didn’t like how they warped the fabric) and currently have two q-snaps that i use for my more portable projects. 7. How many projects have you finished? 7ish. It may be more than that, but I can remember 7 of them. 8. How many completed works do you have currently displayed in your home? None. I haven’t actually FFO’d any of them yet. That needs to be rectified. 9. Do you do more stitching for gifts or keep them for yourself? Most of them I stitch for myself, but I have given a few away. 10. What is your favorite project or finish you are most proud of? Footprints, a Bucilla kit. 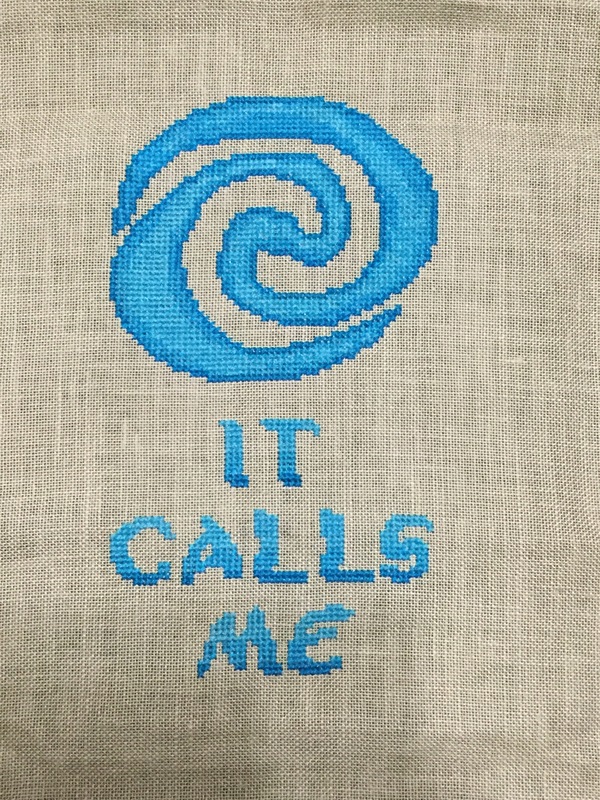 My first time stitching on evenweave. 11. What has been your least favorite or worst experience while stitching? The weird linen-wannabe that i used for Geisha. Nasty stuff. 12. What do you love and what do you hate about cross stitch? I love the ‘zen’ of it. I hate that it takes so long to stitch a larger piece. I currently have a massive piece in progress that I started two years ago, and will likely be in progress for about 4 more. 13. Have you introduced anyone else to cross stitch? Yes! Ishly. I am responsible for pulling some of my older friends and coworkers back into it. They’d been stitchers in the past and for whatever reason stopped. 14. What was your first project and did you finish it, if not what was your first finish? My first project was a cat in a windowsill, that kit that was given to me for Christmas. I never finished it due to a massive counting error and running out of floss. I gave up on it. 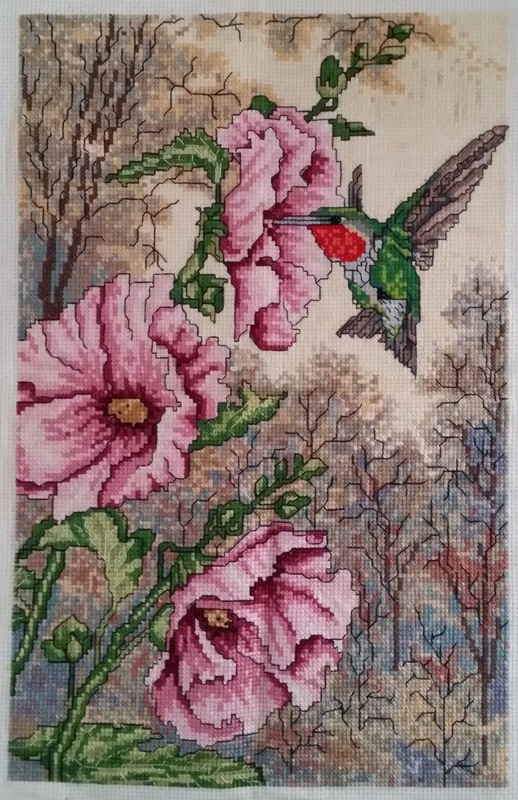 My first finish was a Hummingbird with morning glories that I no longer have, and have no idea where it went. Time for some finished objects! This was stitched for my Grandma. She provided the pattern, floss, and cloth and I the eyesight and needlework. It took about 5 years, and was rather ambitious for me at the time with the confetti-heavy background and the fact that it is full coverage. Before this I had half-heartedly stitched on a few kits that were given to me, and finished only one of them. The rest will be forever lost to the UFO pile due to some glaring miscounting errors. My second finish, ever. 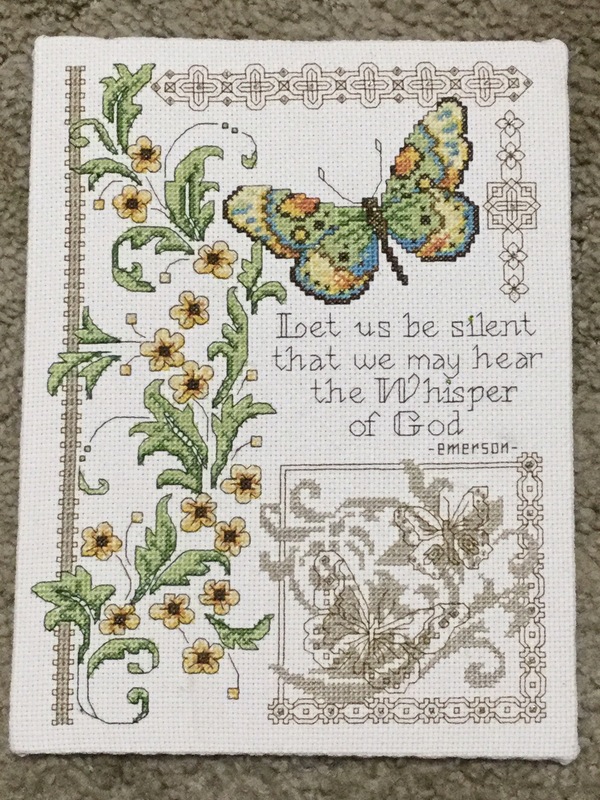 This is a Bucilla kit, stitched on evenweave. If I remember right, it came with this fabric. It was an interesting experience, being as inexperienced as I was, and attempting to stitch over two. I consider it a success, as there was very little frogging involved, and I can recall only one major error. Once I got going on this, it took me about 9 months. A Janlynn pattern that I picked up at some point between the Hummingbird and Footprints. This was my first attempt to stitch on linen. I thought that since I’d stitched on evenweave it would be a walk in the park. Wrong! I’m blaming it entirely on the fabric, though, as it is truly awful stuff – something synthetic and slippery and not actual linen. It was cheap. The next time I use linen, it will be a proper linen, thank you. This was a kit, and a very quick stitch. 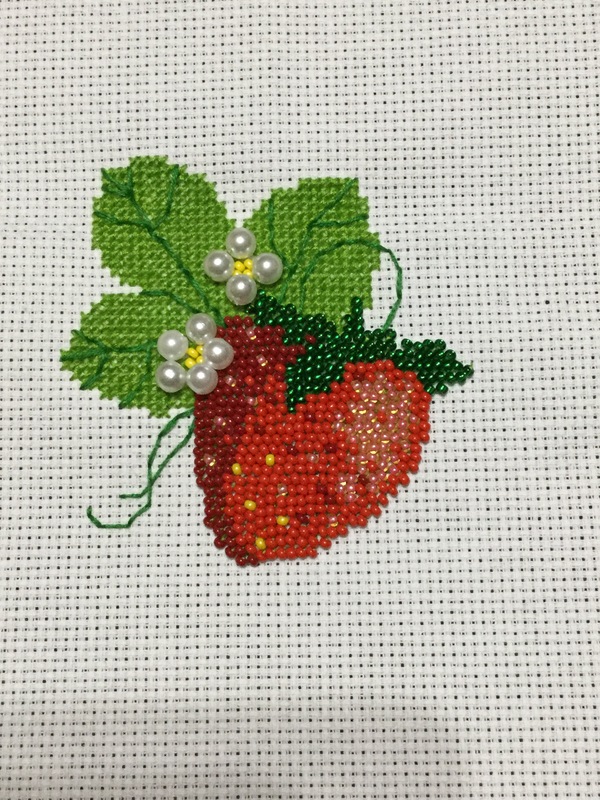 After Geisha, I was sick of french knots, so I attempted some beading. It……worked. Sort of. I learned a lot about beading, and have been considering going back and redoing the beads, but I don’t like touching a finished project, so we’ll see. Most of the beads are in the blackwork on the edges. A Riolis beading kit. This was the first serious beading I did, and once I got into the rhythm of it, I loved it. I’ve also done a dandelion beaded piece that I forgot to take a picture of before I gave it to the friend it was intended for. 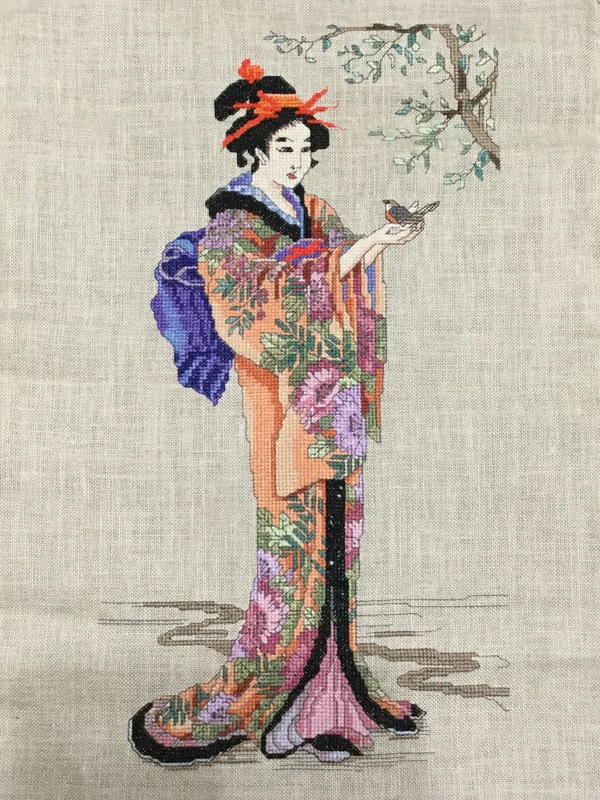 This is a pattern from Cross Stitch Quest, done on a remnant of that awful linen from Geisha. This is going to a friend that loves Moana once I get it finished entirely. I’m not sure if I want to frame it, mount it like a canvas, or turn it into a flatfold. Decisions, decisions….. So, 7 finishes over about 8 years. Considering that I have a great fondness for large projects and full-coverage pieces, not bad. Plans for the future – stitching up all the kits I have on hand (all 6 of them) and then starting on my Heaven and Earth Design stash. I have several patterns I’ve made myself that I’ll fit in as well. I plan to use this as a means to share my stitching journey with anyone interested enough to stop by, or lost enough to stumble through. I hope that what you find here may inspire you in your own crafting, or help you find a new relaxing hobby of your own. I’ve dabbled a bit in just about every needlework craft there is available, but cross stitching and knitting were the two that took root and grew. I am by no means a master of either, but I enjoy them both as a tension-reliever from my high stress job. Knitting I don’t do as much, since I live in a warmer part of the US and for a greater part of the year, sitting with a lap full of wool is not particularly advisable even WITH the air conditioning on. Cross stitch is a full-time, year-round thing with the occasional hiatus when I get side tracked. As for my projects, I do the occasional quick stitch or knit, but I am inordinately fond of massive pieces. I have more lined up than I will likely finish in my lifetime. I work third shift/night shift/insert other term here. In other words, my shifts run from 7 PM to 7 AM(ish). Instead of flipping my sleep schedule at the end of my three day work week I remain mostly nocturnal, much to the bemusement of my family, friends and coworkers. Being an introvert, this works wonderfully for me – I get to pick and choose when and where I have human interaction. If I want to avoid it altogether by doing my grocery shopping at Wal-Mart at two in the morning……then I do my grocery shopping at two in the morning. Those curious wanderers visiting here will probably learn more about me than anyone meeting me in person ever will, as I communicate much more through written word than speech. Am entirely new to this blog thing, so tips and advice would be welcome. We shall see if any type of regular posting schedule emerges, but my crafts are slow and sometimes tedious. Rambling aside, take a look around and enjoy your visit!